Wind…always too much or too little! Off on Saturday May 27th, no crew as my friend Christine had just moved house, but I had a promise she would join me later. There were the usual nerves on leaving Ashlett, especially this year as I hadn’t used my boat since the end of 2015, but I made myself go, heading for Newtown Creek. It turned out very windy. Just at Calshot I reduced to THREE reefs! And had to winch in the yankee to furl it just keeping the good old staysail. I headed for Beaulieu instead, planning to go well upriver into shelter. However at Gins I saw ALBERTINE, the boat of the commodore of our Victoria Association, on a buoy so I picked up the neighbouring one. They came by later for tea and cake, my first visitors of the season. Only £10 to moor too…..not bad these days and I got a wifi signal. I breakfasted on a sunshiny deck to the sound of skylark and oystercatcher, then headed west, by which time it was raining and visibility was poor. I anchored in Swanage in order to surprise my son who was on a dive trip from there. Duly done, but the evening forecast of E4 made me move back into Poole Harbour, to Pottery Quay, where I got a quiet night. Fog came down the next day then the wind got up in the evening. Tuesday, with better weather, I moved out to Studland then on to Weymouth the next day. Chris, my promised crew arrived on Thursday but to my surprise so did my son and granddaughter. He was carrying an expedition sized back pack full of story books, seven cuddlies, several changes of clothes and blankie of course. We had a very excited overnight visit. Lovely, but now I couldn’t leave until much later. During Thursday evening BINAH, JULIE GIRL and BRILL from Ashlett, arrived in the Cove. Lots of visitors! JULIE GIRL and BRILL took the good conditions on Friday to head round Portland Bill for West Bay and then Teignmouth. BINAH headed back for Ashlett on Saturday but I had to wait till my family left. Sunday at 6am we left straight for Dartmouth, as the ports in Lyme Bay are not easily open to my long, deep keel. We couldn’t make the course at first and motor-sailed into a lumpy sea. I found it pretty tiring and Chris got chucked around so much she irreparably broke the toilet seat. By the time we got ten miles off Dartmouth the tide had turned against us and the wind headed us some more, we were going really slowly so I bore away for Brixham. Given the forecast I decided to go into the marina (£34!) To my surprise JULIE GIRL and BRILL were on the events pontoon. Heading out for Dartmouth, the next day, I had a few minutes of panic as the engine alarm went off. After a minute’s thought, I remembered I had cleaned the water filter. Drifting, I threw everything out of the cockpit locker, unscrewed and re-screwed the filter cap, gingerly tried the engine and PHEW all was well. We had a lumpy trip round the Mew Stone and went up river to Dittisham by Agatha Christie’s Greenaway, picked up a buoy and settled down in the rain. It was pretty wet on and off all the next day and Chris demurred at going ashore in the dinghy. I went up to the pub/shop and had a good chat with the owners of MARAUDER, a Halmatic 30, moored near us. All afternoon the peace was shattered by a helicopter constantly overhead with a Grand Banks type boat, large rib, fishing boat and the ferry circling. We found out that Channel 4 was filming the last episode of the” Hunted” or some such programme. The father and son contestants got across the river in time to beat their hunters to win £100,000 apparently. Blow me the next day another lot were at it! This time QS was in the background as a French film crew were doing a programme on Agatha Christie. She is on the French school curriculum apparently. We were even waved off crossing Greenaway’s lawn that afternoon as their drone droned. IONA (from Ashlett) with Jan and Joan were on a buoy near us as we returned next day from a visit to Dartmouth for a shower and supplies, so we had a quick chat. I also heard that Geoff and Pete had spent a very bouncy night down in Dartmouth.” Like crossing the Atlantic all night,” Geoff said! They passed us the next day on their way up to Totnes for a quiet night! There was more drizzle and poor visibility. It was 10th June and I put the boat heater on! On Sunday we moved down to Darthaven as I had managed to book a service for Monday morning, it was pretty windy with gale force winds registering at the Salcombe NCI station. Monday’s engineer looked about 15yrs old. He looked at the stern gland, which I had heard trickling not just dripping. “Hmmm, tricky” , he said. Anyway all was done, even the replacement cabin light fitted. There was one and a half inch travel on the stern gland nut, Gabriel (aged 21) said, and I had had it done supposedly for winter 2015 before we were both laid up. Geoff and Peter had come back to Dittisham, but after we had left. Geoff had an engine problem there while mooring single handed, put out an anchor to avoid a collision, which was then irrecoverable and he had to abandon it. With great help from the harbour master he was safely moored and in the morning the HM brought a second hand replacement anchor and chain. What service! Jan and Joan of IONA turned up as we were leaving Darthaven, to help us leave the pontoon, for which we were very grateful but sorry we kept merely passing by them. It was a very lumpy exit to the Dart, using one reef and the staysail, but we ended up having one of the best sails of the trip, beating to Salcombe. I nearly piled her up later though! As we were coming round to head into wind to take down the main inside the Salcombe entrance a gust caught us and Que Sera took off like a train towards the rocks. I managed to dump the main and was hauling the tiller with all my strength, up under my chin practically. “Help me! Help me!” I yelled.” How” said Chris! ?? We survived. We all left for the Yealm the next day, moored up in a raft and nearly got bashed along all our sterns by a yacht coming in out of control which had already hit two other moored boats on our pontoon. I got hailed by LONDON APPRENTICE with Mary and Ken Endean. They were anchored out by the bar and also heading for Scilly. Sadly we never met up face to face. We had Pete and Geoff to dinner on my boat. Next day we set off for Plymouth where Pete was going to turn back as he was tiring. I showed them one of my favourite anchorages up at Wearde at the junction of the Tamar and the Lynher. They both rafted on QS then we had dinner with Pete this time, followed by a lovely quiet night. Pete and Geoff headed for QAB, not my favourite place, so I went to Mayflower Marina. So nice to be met and have staff take our lines, without asking. But my 10 lt fuel can had to wait while a Princess took on 3000 lts! I did some passage planning. If we pushed on I could get Chris to the Scillies but I wasn’t sure about getting back so she could meet her 25Th deadline. Also being reluctant to use the dinghy would make visiting the islands pointless. I had to get her practising! We collected the replacement loo seat, topped up stores and set off for Falmouth. Not enough wind so despite several slow, sailing attempts we motored, arriving 9hrs later to anchor up at Percuil by St Mawes. Lovely and quiet so dinghy practice commenced. We messed around here for a few days with 34 degrees in the cabin on two of them, but it was too cold for us to swim from the St Mawes beach. In the Tuesday’s xcweather forecast the upcoming F5/6 had faded away so it seemed we could do the Lizard on Wednesday and Scilly crossing on Thursday, giving us three nights there, with a forecast S3/4 to come back. We crossed to Falmouth Yacht Haven and did chores. Fuel, water, pack dinghy, laundry, showers and shop. Throw in an enforced boat move and I was on my knees by day’s end. We were up and off by 6am and from about 9am we could sail with a nice E3/4. Into Newlyn by early afternoon we were lucky and got an alongside berth. During the next days a succession of big yachts from France, Ireland, Germany or Holland rafted in the space between us and the boat on the next finger. The next day gave a W4/5 and it would be a dead beat to Scilly, giving a long uncomfortable trip, so we waited. More motoring, but by bus, ensued. We caught the bus to Mousehole. 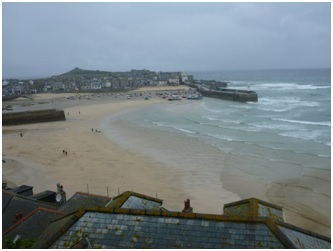 Friday was very windy so we walked into Penzance again and caught the bus to St Ives. We were almost blown away out on its harbour wall though the town was sheltered and hot. In all we had three hours bus ride for free! Our French neighbours had left Newlyn that morning but turned back, the wind was too strong and the waves were too big they said. Later an exhausted Belgian couple arrived from Cork and they said the waves were huge. Saturday gave thick drizzle so another bus ride and on Sunday 25th Chris left for home. I now had three days to wait for Phil my next crew, so I booked a day trip to Scilly on the Scillonian for Monday, in case that was my only chance to visit. Our French neighbours negotiated two big live lobsters off a fisherman just down the pontoon…£20. I wished I knew how to prepare one. I noticed that there were quite a few keep nets with crabs or lobsters hanging off our pontoon. I enjoyed my trip on the Scillonian and checked out a few changes…like the dozen buoys now laid in Porth Cressa and the rather unwelcome appearance of a cruise ship to flood the town with its passengers. Once back home I had a long chat with a Frenchman who admired my boat. We did quite well to communicate for about an hour with my fractured French and sign language. He had virtually no English, could find things a bit difficult on his trip east. The next day I did chores in thick drizzle, put the heater on as I had the day before and dared the ultra basic shower. Well, Newlyn is a port for fishermen not really yachtsmen. Phil and I had both been online looking at the forecasts for our trip to Cork and it didn’t look good. It rained almost all the day he was due to arrive and I met him at Penzance train station kitted up in my wet gear with umbrella, not a great start to his trip. So we motored by bus to St Ives! The waves were rolling in and breaking, flinging spray over the harbour wall. We chatted to the guys manning the Coastwatch station, hearing from one of “bloody NORA” who had been rescued nine times, was taken into nearby Hayle where the crew let her tip over whilst against the wall. A candle fell over and she burnt out! The other watcher had a huge file of common and exotic animals he had photographed from the station, whales, turtles, and rare birds. We spent a very interesting half hour. While waiting for the bus on to Land’s End we saw a 40’ boat coming downwind into the bay. She seemed a bit out of control. As it got closer and closer to the breakers we desperately willed him to come no further. At last he headed for the RNLI buoy and got hold of the pick- up buoy but his boat hook was pulled out of his hand. The bus came and we saw no more but a couple of days later the boat came into Newlyn and Wimm, who was Dutch, came on board for a cup of tea and we heard the end of his story. Happily the ST Ives Coastwatch crew had seen his struggle and called out the RNLI who helped him moor to their buoy. Wimm said he had left Padstow and it was OK but on his way down the coast the waves became huge and he daren’t tackle Land’s End. Meanwhile we motored on by bus round Land’s End, mostly staying dry, huddled in the front of an open topped bus, just having to lift our feet every time we went downhill and gallons of rain water swished to the front! Back home we put up the cockpit tent, poor weather looked to stay for a while. It made a wonderful difference to our comfort. The fan heater went on. Returning from Mousehole the next day I was surprised and delighted to see TUI on the pontoon. She is a Victoria 30 too. Colin visited for tea and biscuits. He had come back from Scilly to avoid bad weather and part to top up fuel, do an oil change and some small repairs. He was returning the next day, 1st July, then sailing for Baltimore. Phil and I had decided to wait for the better weather on Sunday and cross on Monday, the same day Colin intended to set off. We got our fuel cans filled and walked to St Michael’s Mount. Which was closed! We left for Scilly at noon, a bit early on the tide, as we wanted to make sure we were in before dark. We had a good sail up the coast but at the Runnel Stone we put on the engine to help the beat, but we were still 20 degrees east. Eventually after eight and a half lumpy hours we gave in and motored straight for the islands. It usually takes me seven hours. We picked up a buoy in Porth Cressa. It was a rolly night and I was anxious about going on and didn’t sleep much. Monday 3rd July was my granddaughter’s 5th birthday. The first I had had to miss. I told Phil I didn’t want to go on. The thought of 30+ hours like Sunday was awful. Actually it probably wouldn’t have been, the forecast was a perfect W3/4, however we had lost so much time, we had discussed making for Waterford far to the east instead of Kinsale and then we could only afford two nights in Ireland before having to cross to Milford Haven on our way back. There was also the chance that Phil would have to leave before we were back at Newlyn due to more poor weather. I got really cold feet. The trip west had been tiring and my confidence still hadn’t got back to pre C levels. I felt bad to have let Phil down. So I showed him Scilly instead. He loved it and was very kind about me backing out. We pumped up the dinghy and went ashore, got a can of fuel, showered, visited the tourist office and had an expensive but delicious cake at Dibble and Grub. I bumped into Robin Baker, an ex-Ashletteer and Scilly native,on the dinghy pontoons in St Mary’s. He suggested we go to the open mic session in the Bishop & Wolf. We moved round to St Mary’s to avoid the rolly Porth Cressa and go to the pub. We hadn’t been in long when Tresco disappeared in the fog. 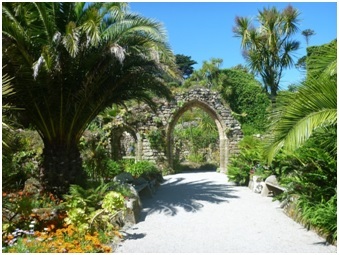 Tuesday, Phil went ashore for stores then we left for the Cove on St Agnes. We went well in to 1m at low water. It was stunningly beautiful as ever, another of my favourite anchorages. After lifting the dinghy well up then rolling the painter round a big rock in the time honoured Scilly tradition we walked round the island. Kayakers, harbour porpoise, seals, views of Bishop Rock, bold thrushes, pebble mazes and stacks. We had a fright though, the tide came in higher than expected and we saw the dinghy very close to the water, and tide unexpectedly rolling over the tombolo, from two headlands away. Phil did his speed walking to retrieve it, phew . The tombolo between St Agnes and Gugh is a strip of white sandy beach with a fringe of rounded pebbles. 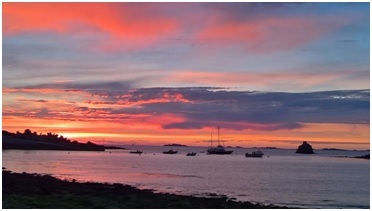 It always covers at HW Springs when swell can roll in to the anchorage from the west, but can remain dry at neaps We repaired to the Turk’s Head in the evening and saw this fantastic sunset, which Phil managed to capture. Wednesday, with a change of wind direction to Easterly , we were beginning to roll. 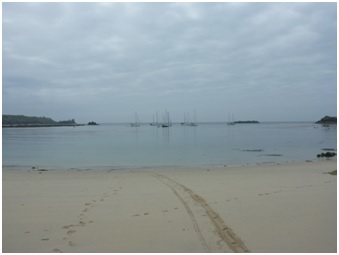 However we had already planned to head over the flats for Tresco. Phil did his second bit of Scillies pilotage and we arrived to crowded moorings. I was wondering if there would be space and depth to anchor when we saw one last, furthest buoy free. I was pleased as we wanted to go ashore to the gardens. I could concentrate on flowers not the turn of the tide. Phil was suitably impressed with the gardens which are crammed with unusual and often spectacular trees and flowers, then in the evening we went to the New Inn for a shower and a lovely meal. We walked to Old Grimsby where I thought we might have coffee at the rather swish hotel on the promontory. It had been replaced with about a hundred rather ugly holiday flats. Ugh, how sad. We were astounded in the morning when the (new, young) harbourmaster who came for our fees, asking where in Southampton we came from, revealed he knew Ashlett as he had grown up in Eling! We enjoyed finding out about his new life in Scilly with his young family. Thursday we discussed weather and strategy. 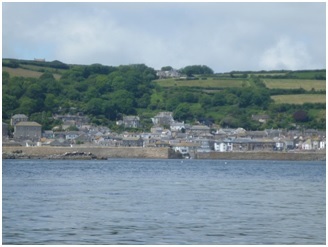 We wanted to SAIL to Falmouth but with a W3 or less it would be a long haul so we opted for Newlyn (not again!) The early fog cleared then returned, then cleared again. We explored Bryher, had tea at the Fraggle Rock café, checked Green Bay for my friend Nick…we missed him by a few days, then sailed for Porth Cressa back over the Tresco flats. We did a few chores early on Friday. We took our laundry to the laundrette, shoved it in the machines but were told only service washes were available at £13.25 each. We went pale! Leaving for Newlyn we had good tidal help as we motored most of the seven hours. There were at least five boats anchored outside, something I had never seen before, but there was plenty of space inside, the light winds had enabled everyone to clear out. Two more cans of fuel and more saffron cake and off to Falmouth. The Lizard was benign and we even managed to sail a bit! Anchoring up at Percuil seven hours later was magic. The full moon shone a path over the water, I’d liked to have watched it longer but I was tired. Sunday 9th 8:30, more refuelling over at Falmouth Yacht Haven and off to Plymouth. 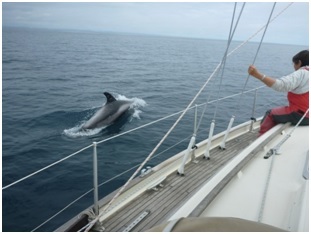 We had two Risso’s dolphin join us for a short while and we fixed a worn gooseneck which came adrift, with a washer and new split pin. Thank goodness Phil was on board! We managed half an hour of lovely sailing down in to the Sound and fuelled up then moored in Mayflower Marina about 18:30. Waking, I was somewhat poleaxed, we set off for Dartmouth. We had a brisk sail out of the Eastern entrance and as far as Bolt Head. It was a very lumpy close reach. We saw a seal munching on something, then motored till we rounded Start Point then sailed down to Dartmouth. Here we had to wait a day while poor weather blew through, it threw it down in the night. We didn’t have to refuel!! Wednesday 12th-July Phil kindly delayed his return home a day to see me across Lyme Bay. It was very windy at the start and we put a reef in and cracked along. However after a few hours the wind slowly died and it was back to motoring. It was painful punching the adverse tide in order to make our inshore tidal gate at 1900, but we did and although I didn’t come in close enough, though Phil had advised me to, and gave us five minutes in the overfalls, we arrived safely in Weymouth at about 21:30. Phil got the 8am train. It had been lovely to have someone so competent on board and I hoped he hadn’t been let down too badly by not making Ireland. I tidied up, restocked and passage planned my next few days. I refuelled, having had two attempts at the fuelling pontoon where I hadn’t managed to be quick enough to get a forward line on. I whipped a stern one on but it was no good . QS drifted around down tide and I had to let it go and climb back in over the pushpit and try again! Outside I put in a reef and with the wind just off dead astern couldn’t quite make the Range waypoint. As I got near so many boats seemed to be cutting inside without the on station Range boat chasing them I cut in too. We had a fast sail down past the Ledge. Nearing Anvil Point the wind came more ahead and finally I motored into Studland Bay. The anchor didn’t hold at the first try but I saw some free Bank’s buoys. Despite it being springs I found one was deep enough. It was a rolly afternoon but with change of tide and the evening wind drop, it was a good, quiet night. I really wanted to be home, so I decided to go straight for Ashlett in the morning. Inside Hurst I just used the jib and we made 5.5 kts all the way. The Solent had more boats racing around than I had seen all trip together. I arrived early and anchored in Power Station creek for two hours, and at twenty minutes to HW of a supposed 4.4m tide, could barely get on the pontoon. It was lovely to be back in the mud!